Theresa Landrum near the Marathon refinery. The Marathon Petroleum refinery in southwest Detroit is no stranger to controversy. But its request to increase sulfur dioxide emissions has sparked a major backlash. The company has done a huge expansion of its southwest Detroit refinery in the past few years. In light of those changes, what Marathon is asking for here is pretty minor. The company wants the Michigan Department of Environmental Quality to approve changes so it can remove more sulfur from oil. It’s doing that to meet new federal standards for cleaner-burning fuel. But the irony is that it will actually cause more sulfur dioxide emissions — about 22 tons per year more — near the refinery itself. This area around this Marathon Petroleum refinery has a lot of heavy industry. It’s in zip code 48217, which is considered Michigan’s most-polluted zip code in terms of air quality. "You're killing us. Your numbers mean nothing. They mean nothing to us," resident Emma Lockridge said to the DEQ. A lot of residents feel like they’re being burdened with even more pollution so the rest of the country as a whole can have less. Theresa Landrum is a longtime resident of this community. She works with the Michigan Sierra Club. Landrum spoke at a public hearing this month. “Any increase is a harm to the community. Any increase,” she said. People in this area already have high rates of everything from asthma to certain types of cancer. They’re worried about the long-term impact of all of this pollution. The DEQ says Marathon’s request meets all the state and federal standards that apply here. Lynn Fiedler, head of the Air Quality Division, says this plan should not worry the public. “When we look at what facilities are impacting human health in that area through sulfur dioxide, Marathon isn’t one of them,” Fiedler says. She says that two coal-burning DTE power plants are the area’s big emitters. She also says the DEQ has to operate within current regulations. But people here question whether the DEQ can really say the air is safe to breathe. The Flint water crisis is hurting the DEQ's credibility here. A lot of people living in 48217 had a pretty low opinion of the DEQ’s credibility to begin with. That’s taken a nosedive after the Flint water contamination crisis. Flint came up a lot at this public hearing — and not just from residents. Dr. Abdul El-Sayed is Detroit’s new director of public health. The federal government sets air quality standards that states have to comply with. This area exceeded the current standard for sulfur dioxide back in 2010. Fiedler, with the DEQ’s Air Quality Division, says the department is working on establishing compliance with the federal standards. “So we are trying to put together a plan to meet that standard, and we have to negotiate with companies to reduce their emissions,” Fiedler says. Still, Fiedler says all the latest monitoring shows the area is meeting the standard — even though computer models show some sulfur dioxide hotspots. These reassurances don’t seem to mean much to many residents, like Emma Lockridge, who also spoke at the hearing. “You’re killing us. Your numbers mean nothing. They mean nothing to us,” she said. The Detroit City Council is hosting another public hearing on Thursday about the Marathon Petroleum refinery’s request. It will be held at the Patton Recreation Center at 6 p.m. this Thursday night (January 28). The public comment period ends Friday, so we can probably look for a decision soon after that. You can learn more from this document from the DEQ and this fact sheet on Marathon Petroleum's proposal. Clarification: The story has been updated to make it clear that the company in question is Marathon Petroleum. 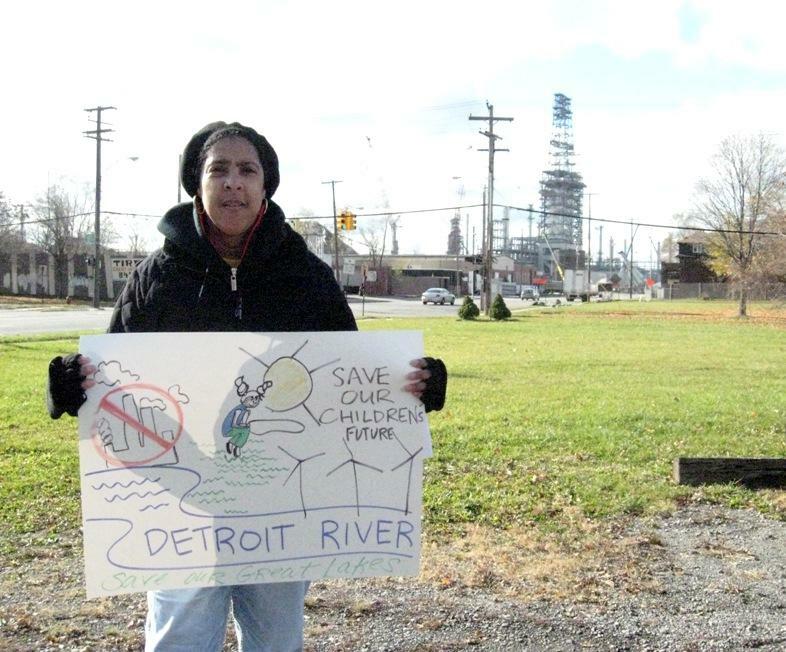 Residents urge state to stop Marathon emissions plan: "Any increase is a harm"
Residents living in the heavily industrial area near southwest Detroit’s Marathon oil refinery are furious about a plan to increase emissions there. And they let state environmental regulators know it at a public hearing Wednesday night. Marathon wants to start removing sulfur, to meet new federal standards for cleaner-burning gasoline. But to do that, it wants to increase local emissions — in the already-most-polluted ZIP code in the state.